On Nov. 19, the team at Delaware County Board of Developmental Disabilities celebrated Thanksgiving together with a traditional Thanksgiving meal with all of the fixings. Following the meal, staff dispersed into the community to give back at nine different community partner locations. Pictured are members of the DCBDD team who helped out at the United Way Teen Room. On Monday, Nov. 19, Delaware County Board of Developmental Disabilities (DCBDD) launched into a day filled with giving thanks. The day began with a Thanksgiving luncheon for the entire staff of DCBDD. The meal was prepared by members of the administrative team. After staff finished their Thanksgiving lunch, they dispersed into the community for an afternoon of giving back. A total of nine different community partners were touched by DCBDD’s outreach. Lutheran Social Services food pantry, and sorting toys at People In Need for the Holiday Clearing House. 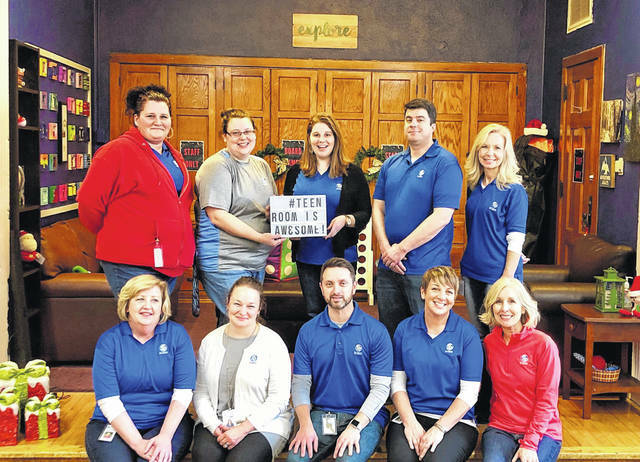 A final group of staff members made fleece blankets to be donated to Turning Point and Delaware County Jobs and Family Services for new babies born in need.